Solidarity with Alvaro! Antifascism and Self-Defense Are No Crimes! The International Confederation RASH UNITED, which gathers hundreds of sections worldwide, with thousands of active militants, express full support and solidarity to comrade Alvaro Paredes, member on BAF Quito, Ecuador. First of all we send him a support greeting; we are already in knowledge of his confession to authorities which take place on May 31, same day of the elaboration of this statement. Same how we express full solidarity and support to Ecuador’s antifascist movement, we remind you that you’re not alone, we are currently working with all type of organizations (social, political, etc) to denounce all the cases where these neo-Nazi groups have been involved, attacking with impunity the social movement. We also ask to the international community to have pronunciations about this, our comrade Alvaro acted in self defense when 4 neo-Nazis were attacking him after chasing him outside his study place. (There is full evidence of these facts) – Alvaro was being subjected to this persecution daily until all the facts that we all know took place. We, the antifascist of the world are not criminals, nor murderers, we act under self defense and we use it only as a last resource when our life is in danger, like the case of our comrade in Ecuador and other cases in the rest of the world. Rash United urgently calls on all sections and all its members in the world to mobilize organizations into Ecuadorian embassies in each country where they are present and make a formal complaint to be heard clearly by the responsible of these embassies. This way, we are going to make direct pressure so the case of our comrade Alvaro takes another direction different than the one the media is trying to make currently, like a gang fight and this cannot be further away of true. These are selective attacks of right wing groups with the economic help of Ecuador’s paramilitary organizations. Also this link of a video made by a neo-Nazi group to which the deceased belonged, and which was allegedly an angel – look at this. 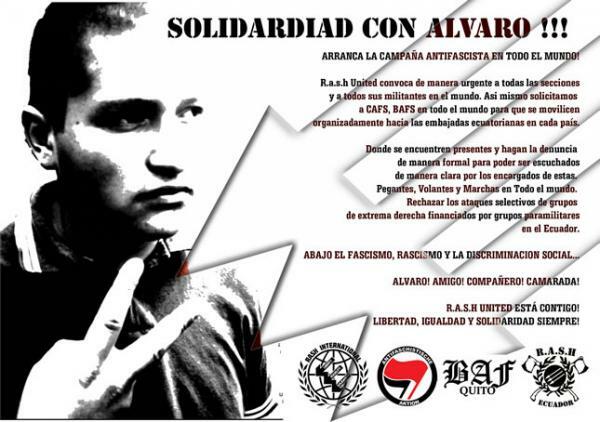 Finally we appeal to all the Anti-Fascist Brigades of the world to show solidarity with Álvaro, it is time to show our support in this rough moments. Remember that any of us could be victim of paramilitary movements of this kind because they abound in the streets of every city. Also to the Coordinadoras Antifascistas of all the world to manifest in the same way, to the comrades of Accion Antifascista and in general to all the social movement that have knowledge of this cases long time ago. Comrade Alvaro Paredes is a political prisoner because he defended himself from the clutches of the puppets of fascism that wanted to exterminate him. Self defense is not a crime, is a tool with which human beings defend ourselves. RASH UNITED IS WITH YOU! FREEDOM, EQUALITY AND SOLIDARITY FOREVER! Warum hast du Punkte in den Link eingebaut? Leider verstehe ich aber nur wenig davon und vieles nicht richtig, weil ich gar kein Spanisch kann. Die Übersetzungsmaschinen sind ja immer beschissen für sowas.